Hello chess blog friends, this is a cool chess event in the US - Time with Aronian and Nakamura: Schein-Friedman Benefit Auction! FM Aviv Friedman writes at the www.uschess.org. Need a creative holiday gift idea? 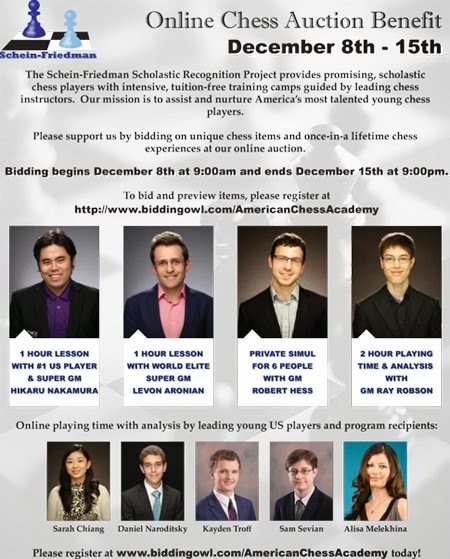 Find details on an online auction to benefit the Schein-Friedman Scholastic Recognition Project headlined by lessons with Levon Aronian and Hikaru Nakamura. The two super-GMs face each other in a match later this week in Saint Louis. Also up for auction: A private simul by GM Robert Hess and lessons with GMs Ray Robson, Daniel Naroditsky, Kayden Troff, Sam Sevian, Daniel Naroditsky & FM Alisa Melekhina. Vladimir Kramnik Chess School in Russia Soon!